Rustin loved the Ghostbusters 2 box set from this year's SDCC, but it wasn't the only Ghostbusters set available. There was another that actually offered something unique. The "We're Ready To Believe You" set takes its inspiration from the Ghostbusters' low-budget tv ad. "Are you troubled by strange noises in the middle of the night? Do you experience feelings of dread in your basement or attic? Have you or your family ever seen a spook, spectre or ghost?" How awesome is Harold Ramis' expression there at the end? Dork. Since this set features all three of the boys wearing matching baby blue labcoats, we're not going to try to stretch it out and cover the same mold over and over - no more than we usually do, anyway. The coat is the same seen a few times already in the Ghostbusters Minimates line, but hey, as long as we've got some space right now, why not take this opportunity to really go into detail about it? The original Minimate labcoat, worn by Mr. Fantastic and a few others, was very straight and blocky, with four 90° corners, rather than smooth lines. The modern coat is the same way at the top, since it has to hang on Minimate shoulders, but it's got a smoother drape, and by the lower edge the rectangle is almost entirely gone. The lapels are larger, but it has no pockets. Overall, a nice piece. On with the show! We'll start with "Ready to Believe" Ray. He's got a happy little smile, something none of the other Rays have sported yet. 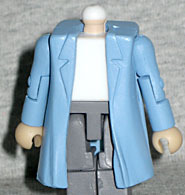 And better yet, we may have finally figured out the trick to making Minimate Ray look like real Ray (aka Dan Akroyd). None of them have really looked right, but try this: pull his hair up slightly. Don't push it all the way down onto his head like a sane person would do, but rather, lift it about a millimeter from his scalp; that small change makes a huge difference. For a handy visual reference, the line painted on his forehead should be entirely visible. The first Egons had a similar hair problem, but they've since fixed that, and "Ready to Believe" Egon gets the new piece (to make sure it sits up high enough, there's a small disc around the peg). The face is painted with a forced half-smile, like the one we pointed out in the video above. He's wearing grey pants and black shoes, and his wide tie is navy blue. He's also the only one who's not wearing a belt. It's hard to believe we haven't gotten a smug half-smile on a Peter Venkman figure yet, but "Ready to Believe" Peter finally rectifies that. The right side of his mouth is tugged up, and he's raising one eyebrow - look at the wrinkles on his forehead. There really must be something about Bill Murray's face that lends itself to caricature. Venkman is wearing a bright blue tie, brown pants and dark brown shoes. 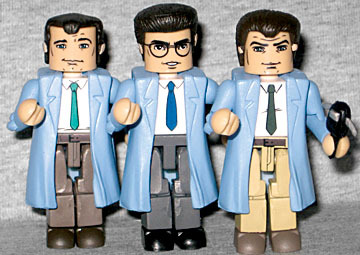 Since Zeddemore hadn't been hired by the time the Ghostbusters filmed their commercial, he's not included in this set. Instead, the fourth spot goes to Dana Barrett, who was watching the ad on tv. By that logic, if you've ever watched the Super Bowl, you're owed a championship ring. Dana was previously included in one of the four-packs, but those things are impossible to find - yes, even harder than this SDCC exclusive. This version of Dana isn't possessed and trampy yet, having just come home from grocery shopping. She's wearing a grey dress and darker grey stockings, but why are her feet the same color as her legs? She wore shoes, you know. Even the prototype on the back of the card has them. Her scarf is painted on, but it's too short: watch the scene again, and you'll see the thing nearly reaches her knees. Clearly they shortened it because they didn't want to run it onto her skirt, but it is something worth noting. 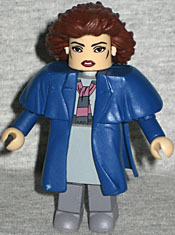 Dana was played by Sigourney Weaver, so with a few BSG Minimate parts, you can finally have the world's smallest Ellen Ripley. She's rocking the giant '80s hair, a piece that only the Dana Barretts have used so far. The lower edge is a little to close to her shoulders, so it will either tip her head forward, or be pushed up off her scalp slightly. 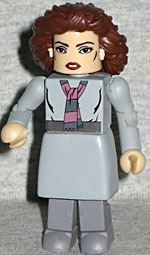 The likeness is clean, but mostly identifiable by virtue of being a woman in a Ghostbusters set. Not much competition there. To change Dana's look, the set includes a coat for her to wear. When she's watching the ad, she's wearing a short wool coat, but that's not what this represents. For one thing, that was grey, and this is blue. No, rather it's meant to be the cape coat she wore when she actually went to the firehouse. It's reused from Old Man Logan, which is pretty clever, and se's got alternate blue arms to complete the look. It does, however, push her hair even more than the body already was. The set also includes a PKE meter for one of the guys to use, but that's not really accurate: the 'busters had all sorts of fake "techy" equipment on their chests during the ad, but none of it was a PKE. But it's not like they were going to tool all-new accessories for a limited exclusive - especially ones with zero future reuse potential. The Ghostbusters 2 box set was a nice offering, giving you all four of the main characters at once and in their proper uniforms for the first time. But really, the "We're Ready To Believe You" set is better: these outfits come straight from the film, more or less, and they're drastically different from anything that's been released in the line before. They're more unique, and that's to their credit.